Spurs striker claims City players are always falling out with each other. Tottenham striker Emmanuel Adebayor has slammed his former club Manchester City as the two sides prepare for their crucial Premier League matchup this weekend according to The Telegraph. 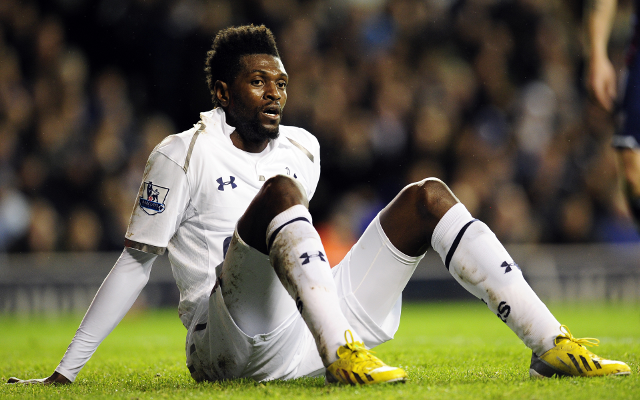 Adebayor joined Tottenham on a permanent deal from City last summer after completing a successful loan spell with the club the season before. The Togo international endured a tumultuous time at the Etihad Stadium following a training ground bust up with his team mate Kolo Toure and repeated fallouts with his manager, Roberto Mancini. Adebayor has stated his belief that his club’s success in the fixture this weekend will depend on how well they are able to snap their opponents’ fragile mentality. ‘We have a chance to win because I was there and whenever things are not going their way there will definitely be a fight or an argument on the pitch and that is how we can take them down,’ said Adebayor. ‘We are playing in front of our fans and we will give them everything and put them under pressure. I don’t have anything to prove to Manchester City. ‘It’s going to be important for me to prove how good I am, but I don’t have any pressure that says I have to beat Manchester City because of the way they treated me because they bought me expensively and sold me for cheap. ‘That has nothing to do with football, I just have to go out there and play my football and find a way to help Tottenham win the game because now I play for Tottenham. Tottenham will be desperate to secure all three points this weekend as they look to close the gap on their rivals for a place in the top four, Arsenal and Chelsea. The club are desperate not to miss out on Champions League football for a second successive season. Spurs thought they had qualified for the competition last year, only for their fourth placed spot to be given to Chelsea after they went on to win the competition last season.